This post is based on conversations at The View Admin 2011 Bar Camp night in which I extolled how Admins are responsible for their own downfall, albeit unknowingly in some cases. There are many out there who do great work, maintain infrastructures others would die for and seem to get anything they need/want or ask for, yet others do not have any of this. Why? I had been thinking about this for some time and when the opportunity came up at the Bar Camp it provided this post. One example came from someone who had migrated users to Notes from Outlook and another who had upgraded from R6/7 to R8.5. Spell check was not turned on by default and the users complained. Now there are a few ways to deal with this but I put it on the Admin(we talked after and all is okay) because my view is shame on you! Policies exist for a reason, use them! When you install clients, didn't you pre-configure them for the PC support teams builds? If you would use it or set it, so would your users, so why make them do all the work? A little bit of time upfront saves help desk calls, irate employees, delays, unprofessional emails and a host of other items. So yes, we as Admins should take the blame because we don't know what we could be doing. Ignorance? Lack of training? Laziness? Lack of Resources? All the above? Go set the default policies for mail clients NOW, save yourself, and your help desk time and grief. In my DDM (Domino Domain monitoring, it is the DDM.nsf) session I pointed out that there is a built-in dashboard, it is FREE, as in, um, zero cost, 100% FREE. This dashboard is what will make or break you annual review! You do want to get a raise correct? Well how does your boss know all the things you have been working on that NO ONE EVER KNOWS ABOUT to keep Domino and your servers running smoothly. This dashboard can be viewed by date, severity, server and even delegation. Yes you can delegate items to your staff. Think about how you look when you have server documented details for your review! Now this will not save you from Microsoft happy CIOs or Google VP of Marketing but think about it this way. What if at every weekly/monthly meeting you had this dashboard for management(I know they can see it at anytime, but you know management, they get sidetracked easily) to get a gauge of what is truly happening in your environment? Get a screen shot of the server being up for 100+ days at a time. Ask everyone else in IT to provide a similar screen shot. Cheap and gimmicky? Yes but you don't want to hear from the new exec how Domino breaks down all the time, especially when it doesn't. But if only you know this information, no one else will champion your cause. And this is the point. Keeping your IBM infrastructure, hardware, software or anything can only be done when you provide management with reasons and examples for what you have and why it is good, working and forward thinking. Here is a hint, technology is not what is important to management. Quiet nights sleep, no emergency calls or screaming from the C level about something being down. And they like new shiny things to play with too. INSTALL TRAVELER! It also is free and you have no reason to NOT use it. Security perhaps? Someone said they are not allowed to use iNotes or Webadmin because Security said they need 2 types of authentication. Get on Domino 8.5.2 and you will see that if you use Certificate Authority and ID Vault there are 2 separate transactions, maybe more involved. If you don't know, ask someone, search Google. But never, I mean NEVER let Security people push you around or Firewall people or OS or hardware or anyone. You are a Domino Admin, you know or deal with more than any one of these people ever will and they should bring information to YOU not have you prove it to THEM! 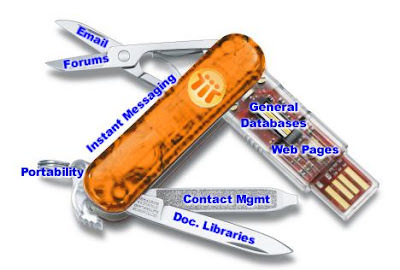 You are a swiss army knife they are just one solitary tool, use it or lose it. If you are not doing these basic things you will lose control of your environment, to the Cloud or some other vendor. If you run apps, get transaction details by day/week/month/quarter and get them into the executives hands. Make a simple view in the app if possible JUST FOR EXECS. Hint, ask the developers to help. If you run an app that every sale MUST get posted, send a report to the VP of Sales. They will love you for it because the sales people lie daily about leads and deals, but here you have details. Nothing signed, nothing entered, you know and now so do they. Make others accountable so they back you up when you need it. Think outside the cubicle! If you run mail, point out mean time between failures, if any, and the number of messages sent hourly, daily, weekly, etc.. and the down time and what that equates to in emails which also equates to money. IBM was not wasting money on buying Cognos, management wants analytics and the more you provide the better for you. Why? Because when the new CIO walks in and says where's my Sharepoint or Outlook, YOUR manager and others will point them to all of the details you have been sending, showing and backing up the premise that a whim does not make money. A well maintained infrastructure makes money or at break even doesn't lose any money because of down times. Which is just as important. Talk about Uptime whenever possible. Sure we all patch servers and need down times but if you can show 0% downtime aside from planned schedule outages that goes a long way. None of this may make a difference in some cases, but if you are not out there getting the basics to the people that will help you when you need it, then what are you doing with your job? Set the bar high, make it so high no one could possibly get into your infrastructure to knock out Domino or an i series or Linux or whatever is that important to you. You the admin can do this, developers have a future in other languages but as an admin you may not get retrained or an opportunity to learn and experience more so make the most of it. PS - Websphere IS IMPORTANT to your future, take the time, learn it or at least get familiar with administering it because Sametime, Connections, Forms, Quickr already are there. Thought about this, but I prefer to believe everyone has solid servers these days. They should usually and if not, that is what Clusters are for, so as far as i am concerned there is always uptime. But yes, this would be helpful to people. But possibly shows the downside too. So be careful on usage. Good question, no great question, the answer of course varies among all of us and all of the employees types. AA's require different things from sales people for instance or tech people. but policies are important as is giving as much as possible to everyone to get the most out of the systems.